Nakhon Ratchasima (Thai: นครราชสีมา, [náʔkʰɔːn râːt.tɕʰa.sǐː.maː]) is one of the four major cities of Isan, Thailand, known as the "big four of Isan". The city is commonly known as Korat (โคราช), a shortened form of its name. 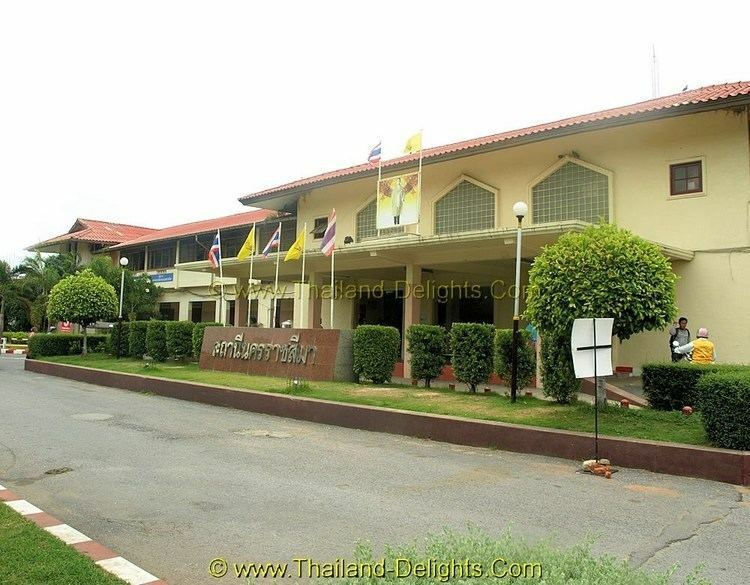 It is the governmental seat of the Nakhon Ratchasima Province and Nakhon Ratchasima District. Nakhon Ratchasima is the heart of the Nakhon Ratchasima metropolitan area. Korat is at the western edge of the Korat Plateau. Historically, it once marked the boundary between Lao and Siamese territory. It is the gateway to the Lao-speaking northeast (Isan). Its location is 14°58.5′N 102°6′E. As of 2010, the municipal area had a population of 142,645. Archeological evidence suggests that in Sung Noen District, 32 km west of present-day Nakhon Ratchasima (Korat) there were two ancient towns called Sema ("Bai sema" (ใบเสมา) are notable artifacts of the Korat plateau) and Khorakapura. (Pali púra becomes Sanskrit puri, hence Thai บุรี, บูรี (buri), all connoting the same as Thai mueang: "city with defensive wall".) Noting that, the real names of the two ancient towns are not known and the names "Sema" and "Khorakapura" were only assigned in the 20th century. The latter name was shortened to Nakhon Raj. (Nakhon (นคร) derives from Sanskrit nagara (नगर), "city"; Raj (ราช), from Sanskrit Raj, "sovereign.") 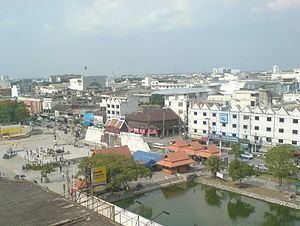 The present city name is a portmanteau of Nakhon Raj and Sema. The city is commonly known as "Korat" or "Korat" (Thai: โคราช), which is a short version of the ancient Khmer name "ankor raj". Prior to the 14th century, the area of Nakhon Ratchasima was under Khmer empire suzerainty and known in Khmer as Nokor Reach Seyma or Nokor Reach Borei, and Koreach. 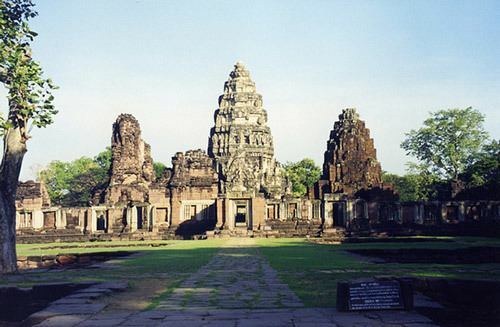 Phimai, to the north, was probably more important. King Narai of Ayutthaya in the 17th century, ordered a new city built on the site to serve as a stronghold on Ayutthaya's northeastern frontier. Nakhon Ratchasima was thereafter mentioned in Siamese chronicles and legal documents as a "second-class" city of the Ayutthaya Kingdom. A royal governor ruled the city in a hereditary position. After the final phase of the Ayutthaya kingdom ended with its complete destruction by the Burmese in 1767, a son of King Boromakot attempted to set himself up ruler in Phimai, holding sway over Korat and other eastern provinces. King Taksin of the Thonburi Kingdom (1768–1782) sent two of his generals, brothers Thong Duang and Boonma, to defeat the prince, who was executed in 1768. Thong Duang later became King Rama I of the kingdom, and Korat became his strategic stronghold on the northeastern frontier to supervise the Lao and Khmer tributary states. In 1826, Vientiane King Chao Anouvong, perceiving Siam as weakened, attacked Korat in the Laotian Rebellion against King Rama III that was to rage on for two years. Lady Mo, the wife of the deputy governor at the time, is credited with having freed the city from Anouvong's army, and has been honored with a statue in the center of downtown Korat. A full account of the war and its impact on Laos and Siam, is detailed in the book, Lady Mo and Heroism at Tung Samrit, written by Frank G Anderson. The city's old wall, east of the monument was designed and built by a French engineer who is believed to be the one who also built Naraimaharaj Palace in Lopburi. The French-based design is reflected in the moat system that surrounds the innermost portion of the city. Nakhon Ratchasima continued to be an important political and economic center in the northeastern region under the Monthon administrative reforms of the late-19th century. In November 1900, the Royal State Railways of Siam began operation of the Nakhon Ratchasima Line from Bangkok with Korat Station as its terminus. The Ubon Ratchathani Line to the town of Warin opened 1 November 1922. The Thanon Chira Junction to Khon Kaen opened on 1 April 1933. Korat station was changed to Nakhon Ratchasima Railway Station in 1934. In October 1933, after the Siamese revolution of 1932 ended the absolute monarchy, the city became the headquarters of the Boworadet Rebellion, an abortive uprising against the new government in Bangkok. In April 1981 during another attempted coup, the government, together with the royal family, took refuge in Korat. From 1962-1976, during the Vietnam War, Korat Royal Thai Air Force Base hosted components of the Royal Thai Air Force, the United States Air Force, and a complement of the Royal New Zealand Air Force (RNZAF). After the US withdrawal in 1976, the Thai Air Force assumed full control. During the 1980s and early-1990s, the airfield was jointly operated as a civil airport for Nakhon Ratchasima. This ended with the opening of Nakhon Ratchasima Airport in the early-1990s. On 13 August 1993, Thailand's worst hotel disaster happened in the city, the collapse of the Royal Plaza Hotel, killing 137 people. There are generally three seasons in the region: Hot (February - May), Rainy (May - October), Cold (October - February). In the cold season, minimum temperatures in Korat proper will drop to about 18 °C (64 °F), and in rural areas, down to about 12 °C (54 °F). Korat's economy has traditionally been heavily dependent on agriculture. It is known as a processing centre for Isan's production of rice, tapioca, and sugar. The Isan region accounts for half of Thailand's exports of those commodities. Together, these three agricultural commodities employ 700,000 Isan families. Korat is also one of two sites in Thailand manufacturing disk drives by Seagate Technology, employing 12,100 workers in Korat. Korat has become the commercial hub, not only for Isan, but also for neighbouring Cambodia and Laos. All three of Thailand's largest Bangkok-based department store chains have invested in expansive outlets in the city, which will boast one million square metres of retail space by late-2017. Nakhon Ratchasima Airport lies 26 km east of the city. There are no scheduled air services operating from the airport. Nakhon Ratchasima is on the northeastern railway line, connecting Bangkok with Ubon Ratchathani and Nong Khai. In 2017, a 60-kilometre dual-track line will connect Korat to Khon Kaen. It is the first segment of a dual track network that will connect Isan with the Laem Chabang seaport. Passing near the city is Mittraphap Road (Thailand Route 2). A new motorway connecting Korat to Bangkok is under construction in 2016 and will reduce travel time on the 250 kilometre journey to just over two hours. There are four universities in the area. The 80th Birthday Stadium is the main stadium in His Majesty the King's 80th Birthday Anniversary, 5th December 2007 Sports Complex. It is home to Nakhon Ratchasima FC who competes in the national first tier football level, Thailand Premier League and it was used for the 2007 Southeast Asian Games. The stadium is in the former SEA Games sports complex on Highway 304 (Pak Thong Chai Road) to the southwest of the city. The stadium is all-seats with a capacity of 20,000. Korat's daily Thai newspaper is The Korat Daily. An English language newspaper, The Korat Post, is published monthly. What's on Korat is an English website and Facebook page that focuses on up to date news on events, food, drink, sports and local services in English. "Expats in Korat / Nakhon Ratchasima" is a very active Facebook group for asking any questions about life in Korat.